By my reckoning, this is the 33rd vintage of St Hugo released. That’s impressive no matter which way you look at it. Indeed, that record is important because the label has looked under threat at some points, particularly when it became ‘Jacobs Creek St Hugo’. Importantly, the style still hasn’t changed drastically. Sure, ripeness levels, fruit sourcing, oak choices etc. have evolved, but the basic form has stayed the same. What has changed in the St Hugo recipe is where the wine is made. The label now has its own winery in the Barossa down the road from the Jacobs Creek winery at Rowland Flat. Fruit is thus trucked to the winery in the Barossa, and then treated in a classic fashion with of fermentation into static fermenters. Another change is the oak maturation. 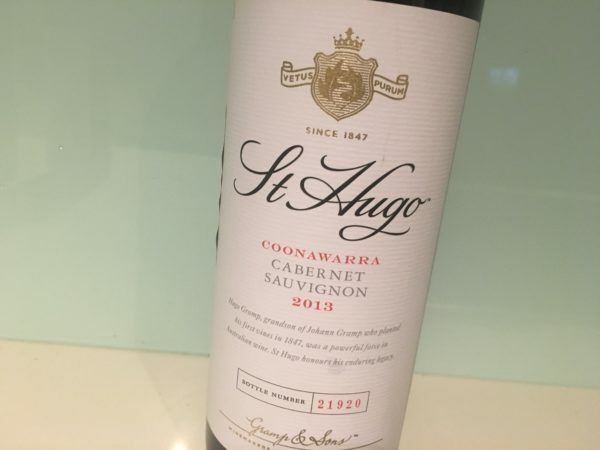 This St Hugo Coonawarra Cabernet Sauvignon 2013 spent 22 months in 55% new French, 7% new American (and the rest older) oak barrels, with the leanings ever more towards finer French oak. Numbers: TA 5.9g/L, pH 3.65. No disguising the fruit source though, the nose carrying a dash of mint to signal its Coonawarra home. Deep and quite extractive, it’s a very tight and oak shielded, the dark berry fruit noticeably ripe. That riper, drying edge and slight warmth is the only real negative I can see. It’s probably not as classic as the better balanced 2012 or 2010, but the quality is surely there. The depth of drying tannins and long, if slightly oaky, finish also mark this as a long-lived wine. My score is probably conservative in the scheme of things, but there is more to come in the future. Best drinking: 2021-2032+. 17.7/20, 92/100+. 14.3%, $54.99. Would I buy it? Not yet. Buy online: Langtons Fine Wine.